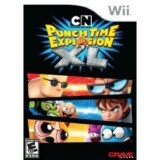 Family Friendly Gaming was provided a reviewable copy of Cartoon Network Punch Time Explosion XL on the Wii. This home console game is also on the Playstation 3, and Xbox 360. There are two main modes in Cartoon Network Punch Time Explosion XL. The first is the story mode. This is playing the game with a character or characters through the story. The other is battle mode. This mode is like a fighting game where you battle with the different Cartoon Network characters. The side scrolling 2D levels look okay in Cartoon Network Punch Time Explosion XL. There are various creatures to fight off. Players also need to free the enslaved Cartoon Network characters like Chowder by fighting them. 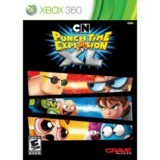 The main action element of Cartoon Network Punch Time Explosion XL is the violence. There is some blood in this game, but a whole lot more punching and kicking. The narrator is funny at times, and crosses the line at others. Since different people have different tastes in humor, expect that Cartoon Network Punch Time Explosion XL could offend you. Or you could be on the other end of the spectrum and find it very funny. The music is good at setting the inter dimensional incursions mood. There are twenty-six playable characters in Cartoon Network Punch Time Explosion XL. There are also twenty-six battle arenas. The story mode is there to unlock characters, and earn enough currency to purchase others. The battle mode is where most will find the replay value. Since fighting games are known for their replay value. Some people actually enjoy bashing in their friends heads digitally. Four family members can brawl in this game at the same time. The controls can be confusing on the Wii. There are many different commands, combinations, and things to keep mental track of. Some players needed a cheat sheet to remember which was the jump button for example. 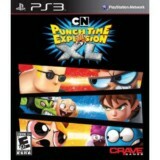 The game play in Cartoon Network Punch Time Explosion XL gets repetitive. Do some jumping, fight some guys, and then do some more jumping. Can you guess what came next? The fighting system in Cartoon Network Punch Time Explosion XL contains numerous moves, and characters control differently. The players that had success in Cartoon Network Punch Time Explosion XL are the aggressive ones. You know the ones that get you before you can get them back. And they suffocate you with their repetitive attacks.